Financial litigation, disputes arising out of a business purchase or sale, contracts, trade secrets, non-compete covenants, etc. Calfee’s Business, Corporate and Commercial Litigation attorneys work with public and privately held enterprises on a diverse range of business needs. Our attorneys have extensive experience in financial litigation including banking, lender liability, and credit disputes. They counsel clients on issues and disputes arising out of the purchase or sale of a business, contracts, and the Uniform Commercial Code. Our litigation attorneys have prosecuted and defended numerous trade secret actions and matters involving non-compete covenants. They also have defended claims of business defamation and disparagement, fraud, and negligent misrepresentation. 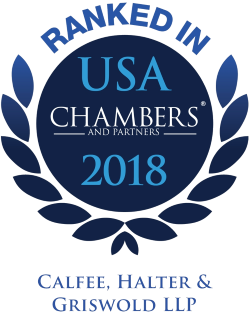 Calfee was selected for inclusion in the 2019 "Best Law Firms" rankings by U.S.News –Best Lawyers in America in Commercial Litigation (National and Metropolitan Cleveland, Cincinnati and Columbus rankings). Obtained $3.8 million jury verdict against business broker for intentional interference with buyer’s prospective purchase of business. Defended a multi-million dollar claim against a distributor of medical products for alleged breaches of distribution agreement. Prosecuted and defended numerous trade secret actions and matters involving covenants not to compete. Defended numerous lender liability claims, including obtaining summary judgment dismissing lender liability claims against a foreclosing bank. Successfully defended against a $200 million action for breach of lease filed by major parking garage operator. Represented partners in dissolution action against charges of breach of agreement. Won fraud judgments against sellers of businesses. Defended against and resolved multi-million dollar claims against a medical equipment manufacturer for successor liability and fraudulent transfer in connection with the purchase of the assets and business of another medical product manufacturer. Frequently retained at the appellate level to seek reversal of unfavorable verdicts, including obtaining a reversal of a jury verdict against a utility for alleged violations of public utility laws. Represented Swedish textile manufacturer in jury trial in which the United Nations Convention on the International Sale of Goods was applied to a dispute involving the sale of products to a national distributor. Obtained $9 million jury verdict for fraud in termination of a shopping center lease.